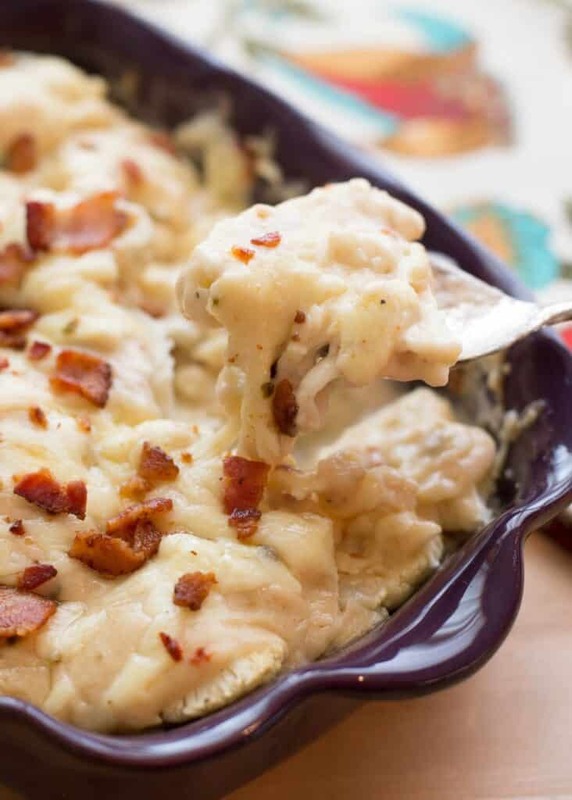 Fresh cauliflower smothered in a creamy sauce then topped with a sprinkling of bacon and baked until bubbling with gooey melted cheeses; this Creamy Cauliflower and Cheese with Bacon receives two thumbs up from all of my kids every time I make it. It never fails to amaze me that my kids who would be very unlikely to choose to eat cauliflower on its own will happily devour multiple servings of it when it is prepared this way. Of course, what’s not to love about vegetables covered in a spicy cheese sauce and topped with bacon, right? While there are plenty of awesome pasta dishes that my family loves, this Creamy Cauliflower ‘n Cheese with Bacon will most definitely not leave you thinking that something is missing. 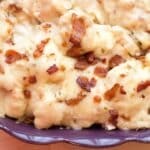 This Creamy Cauliflower ‘n Cheese with Bacon is an awesome side dish for almost any meal, but it’s plenty hearty enough to be a main dish as well. For my meat loving family, I typically serve this with oven roasted or pan-fried chicken thighs. If you’re looking for more terrific cauliflower recipes to try, this Garlic and Paprika Roasted Cauliflower and this Spicy Caramelized Cauliflower both disappear almost as fast as I can cook them! Old Bay Cauliflower Salad and Crispy Cauliflower Tacos both sound amazing too. 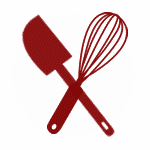 Kitchen Tip: I use this baking dish, this saucepan, and this flat whisk to make this recipe. Rinse and pat dry the cauliflower. Remove all the leaves. Slice from the top to the bottom stem, into 1/4" thick slices. The cauliflower should basically fall apart. The idea is to create thin bite size pieces. Layer the cauliflower into the bottom of a baking dish, I use a 10-inch square or round dish. Season the slices generously with salt, pepper and red pepper flakes. Set aside. Preheat oven to 350 degrees. In a saucepan over medium heat, melt the butter. Add the starch and whisk to combine. Add the milk and continue whisking until smooth and heated through. Add half of the cheese and stir to combine. Continue whisking until the cheese is melted and the sauce is smooth again. Add the rest of the cheese (reserving about a cup's worth for topping) and stir again until the sauce is smooth and the cheese has completely melted. Taste the sauce and adjust the salt and pepper to taste. Pour the cheese sauce over the cauliflower and top with the remaining cheese. Sprinkle with bacon, if desired. Bake for 20 minutes, or until cheese is golden browned and bubbling. Enjoy! I absolutely love how creamy this dish is! I love this recipe. Cauliflower is so under-rated by some folks. It's so versatile and we love the taste. This is perfection, I can't wait to try this. I love this, I am a huge cauliflower fan. Unfortunately my family won't go near it. But maybe covering it in cheese would help! I made this today and it is so delicious!!! Hi Mary, I'm making this tonight. Realized I don't have cornstarch. I have plain and self rising flower. What - and how much - can I substitute? Thanks!! Hi Kim, I emailed you back, but just in case you missed that, you can substitute two tablespoons of regular flour for the cornstarch. It should work just fine. O M G ! ! ! Mary, this was AWESOME!!! Thank you for your help. I think I'll start a pinterest board for Tried It & Liked It. This will be the first pin on it!! Love your recipes and how you are so good to reply to questions! Hi Mary! I've just discovered your beautiful blog! Bacon and cheese...YUM! 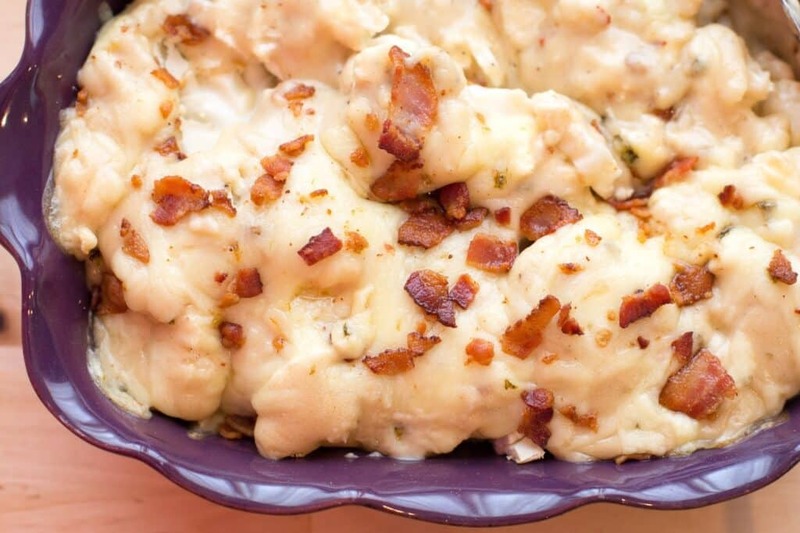 Hi, this recipe for cauliflower n cheese n bacon sounds really good... do u cook the cauliflower ahead of time before u add the cheese sauce n bacon? I do not. I make this dish as written in the recipe. Enjoy! Hi, this recipe for cauliflower n cheese n bacon is really good. I doubled up on the cheese.